1. Whisk together vinegar, lemon juice, sauces and green onions. Set aside. 2. Scrub oysters with a stiff brush under running water. Place on a hot barbecue grill. Put the cover down. 3. After the shells start opening, uncover the grill and cut through the eye of the oyster to take off the top shell and leave oyster on the half shell on the barbecue grill. 4. Spoon sauce over oyster and grill over high heat until sauce boils. 5. 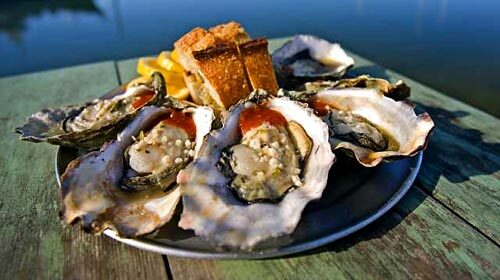 Remove oysters from grill and serve immediately.